How do you find a dinosaur? One of the most common questions about dinosaurs is how to find one. Paleontologists don’t go digging random holes and crossing their fingers, but the process hasn’t changed much in over a century. Most discoveries aren’t even made by professional paleontologists, but by amateurs. Whether a seasoned professional or just a weekend rockhound, the hunt usually begins by prospecting–trekking around rocks of the right age, scanning for bone weathering out of the ground. Scientists spend much of their time looking for exposed fragments. When they are fortunate enough to find bones eroding out of the sediment, they carefully excavate around the bones, making sure not to damage them. Sometimes glues are applied to help protect brittle fossil bones, which are protected beneath the surface where they have rested for tens of millions of years but can be ravaged quickly once they return to the elements. Usually, field workers dig around the bones, creating blocks of stone that they wrap in burlap and plaster–like a doctor setting a broken limb. This protective jacket keeps the fossil intact during travel back to a museum or research institution. Once there, scientists can work carefully under laboratory conditions to carefully remove the matrix from the fossils and prepare the bones for study and/or display. Sometimes this process can take months, and some specimens wait years for their chance to be prepared in this fashion. But finding new dinosaurs doesn’t always require a trip to a desert. Many dinosaurs are found in museum storerooms, incorrectly identified decades earlier or never properly studied at all. Paleontologists can sometimes make drastic discoveries just by heading down to a basement vault. If you want to find dinosaurs yourself, it’s easiest to head to a museum or a library in your hometown. But there are several dinosaur dig programs available for kids and adults alike. We highly recommend being a paleontologist for a day, or at least a few hours. What better way to explore the past than to dig up a dinosaur with your own hands? Share your dinosaur dig photos with us on Facebook and Twitter using the hashtag #TDIDinos. 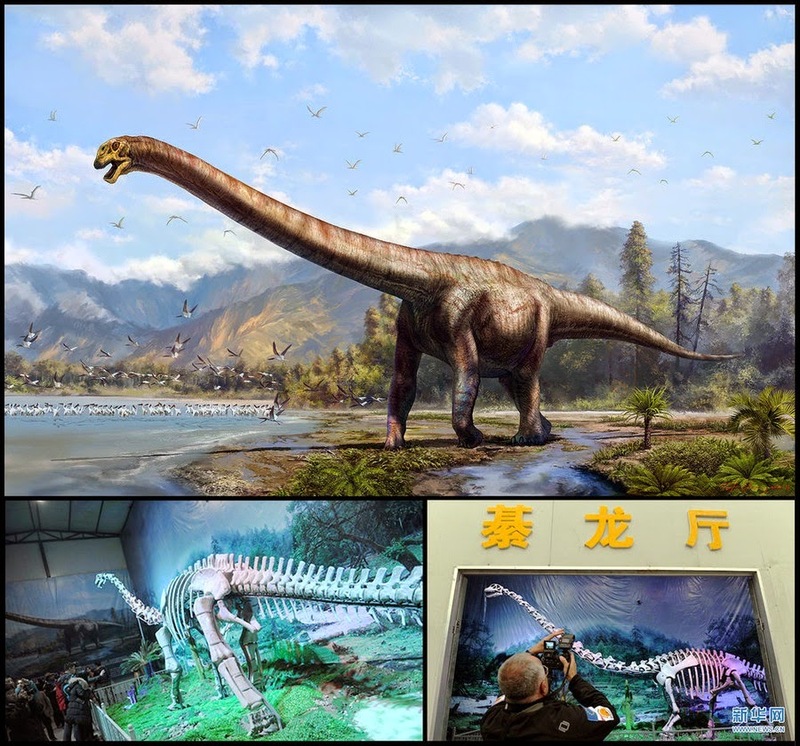 Qijianglong belongs to a family called mamenchisaurids–long-necked sauropod dinosaurs with extremely long necks compared to the proportions of some of their close cousins. The holotype specimen dates to the late Jurassic and includes a complete series of 17 neck vertebrae, 6 vertebrae from the animal’s back, 28 tail vertebrae, ribs, and other skeletal elements–including parts of the skull and jaw, which are exceedingly rare in sauropod dinosaurs. 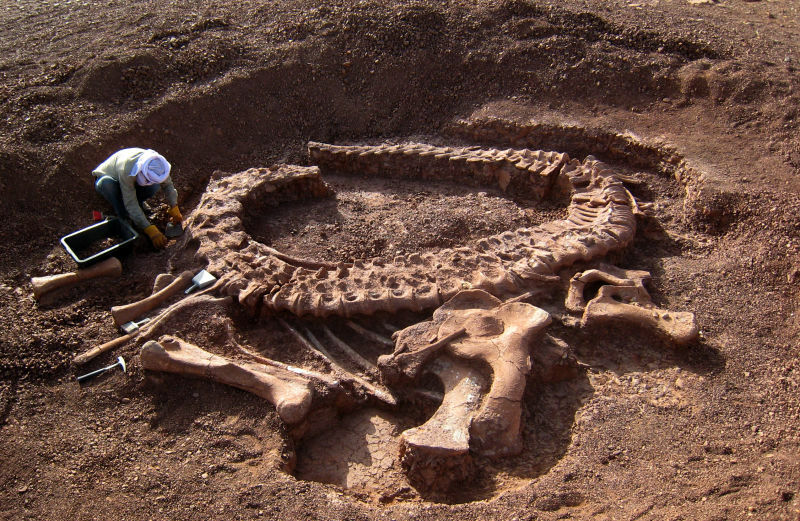 Paleontologists estimate the holotype specimen of Qijianglong stretched to about 50 feet long. What’s even more surprising is that this particular specimen comes from a juvenile. Qijianglong still had growing to do. Love mamenchisaurs, diplodocines, and other long-necked dinosaurs? Share your sauropod photos with us with us on Facebook and Twitter using the hashtag #TDIDinos. On this day in dinosaurs, Masateru Shibata and Yoichi Azuma announced the discovery of a primitive hadrosaur found in Japan. The dinosaur dates back to the early Cretaceous and the remains of the individuals found appear to be from sub-adults, so its adult size is not yet known. 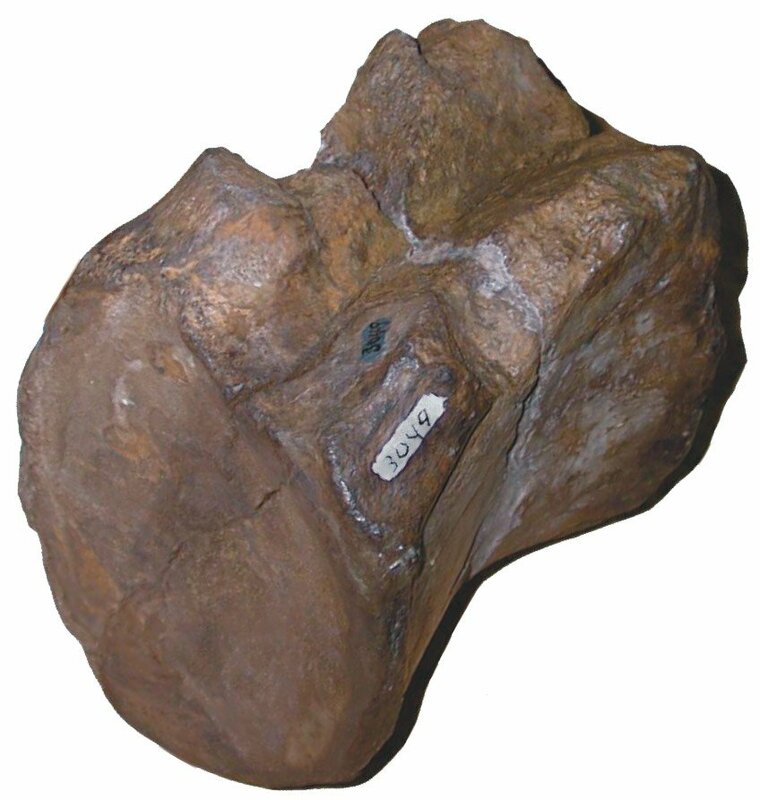 Kochisaurus is named after the original title for the Fukui Prefecture, where the fossils were first unearthed. The holotype specimen includes a partial maxilla with teeth, along with additional post-cranial skeletal elements. Differences in Kochisaurus (namely the addition of an antorbital fossa–a depression that marks the closure of a structural gap called a fenestra–in the skull, as well as signature ridges on its teeth) separate this hadrosaur from several others who lived at the same time in Japan. This hadrosaur diversity is intriguing for paleontologists who want to understand the proliferation of the group. Share your favorite hadrosaur photos with us on Facebook and Twitter using the hashtag #TDIDinos. On this day in dinosaurs, we celebrate Capitalsaurus Day–a commemoration of a mysterious dinosaur without a proper scientific name and which has never been properly described, and yet is honored with the name of a street in the United States capitol. In 1898, while digging a Washington, D.C. sewer 45 feet below street level, workers discovered a section of a dinosaur backbone and tail. The contractor, J.K. Murphy brought the bones to the Smithsonian on January 28th of that year, and they were sent to Yale a decade later for more precise identification. Paleontologist Richard Swan Lull determined that the bones belonged to a new species of Creosaurus, which he named Creosaurus potens in 1911. A decade later, the Smithsonian’s Charles W. Gilmore reasoned that the animal might have been Dryptosaurus all along, reclassifying it into a new species he called Dryptosaurus potens. More than half a century passed without additional discoveries to illuminate the dinosaur’s identity. In the late 1980s, Peter M. Kranz studied the fossil material and concluded it was not sufficiently akin to Dryptosaurus. He began referring to the animal as “Capitalsaurus” (It should be noted that informal names for species or common names for animals, plants, etc. are not italicized). Even without formal acknowledgement from the scientific community and no official description of the animal, the D.C. Council made Capitalsaurus the District’s official dinosaur in 1998 and proclaimed this day as Capitalsaurus Day in 2001. 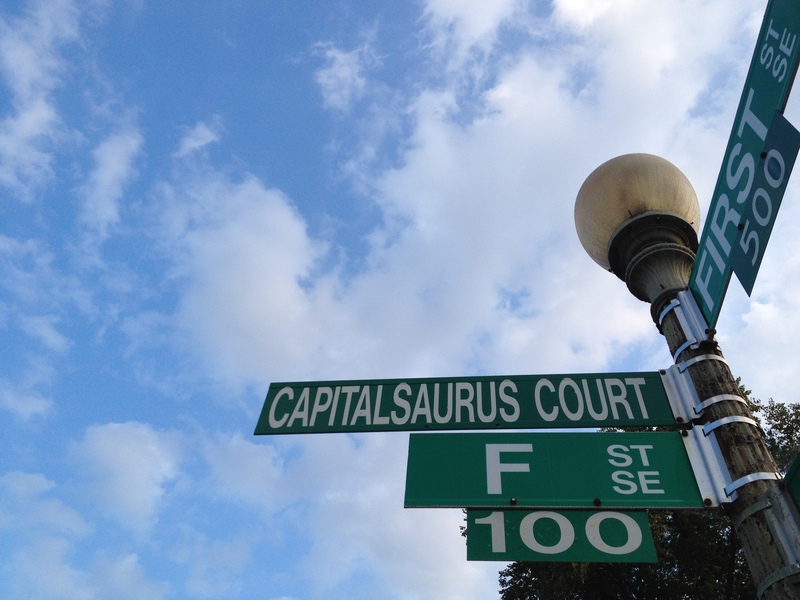 On January 28, 2000, the block of F Street where the fossil was first unearthed was proclaimed Capitalsaurus Court. 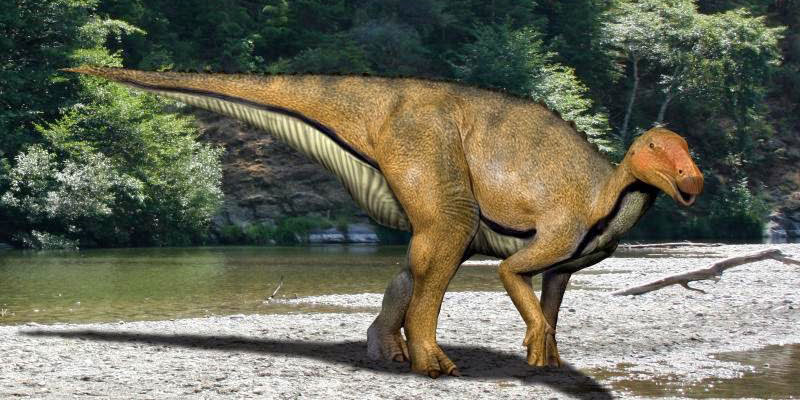 We may never learn more about this mysterious creature, but the next time a building foundation is excavated, or a new sewer line requires trench digging, some lucky worker may find more of Capitalsaurus. Until then, we’ll just enjoy the holiday. Have you visited Capitalsaurus Court? Share your favorite photos of the street sign or your snapshots with D.C.’s dinosaur displays with us on Facebook and Twitter using the hashtag #TDIDinos. On this day in dinosaurs, we look back on the discovery of Cretaceous stripes. Determining how dinosaurs looked in life has always been one of the most elusive questions in paleontology. Fossilized pigments in breathtaking feathered dinosaur specimens from China revealed the colors of Mesozoic plumage for the first time. But dino plumage isn’t just long flight feathers–dinosaurs had quills, fluff, and fuzz. Feathers seem to have evolved for insulation first and then were modified later to allow flight to occur. One of these fuzzy fellows was Sinosauropteryx, whose long tail was adorned with light and dark bands. 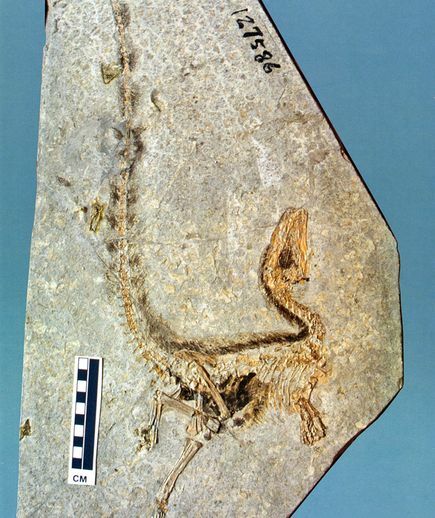 The fossil’s coloration is visible even to the naked eye, but a team of paleontologists led by Michael Benton from the University of Bristol, and Zhonghe Zhou from the Institute of Vertebrate Paleontology and Paleoanthropology in Beijing studied Sinosauropteryx in more detail. They found two types of melanosomes (pigment-carrying cells) on the little dinosaur: eumelanosomes which are shaped like sausages and represent black pigment in today’s animal kingdom, and sphere-like phaeomelanosomes which produce a ruddy red coloration. The animal’s tail appears to have orange and white stripes and resembles that of a modern ring-tailed lemur. While some of the colors may have degraded over time and it’s unlikely we’ll ever be entirely certain of the colors that may have been present in life, it’s reasonable to imagine Sinosauropteryx showing off its banded tail for potential mates 100 million years ago. Share your favorite feathered fossil photos with us on Facebook and Twitter using the hashtag #TDIDinos. On this day in dinosaurs one of the most legendary personalities in all of dinosaur paleontology was born. Andrews showing off some dinosaur eggs. / DinoHunters.com. When Roy Chapman Andrews was told there were no job openings at the American Museum of Natural History, he took it upon himself to begin cleaning the floors. He worked his way into the taxidermy department, then into paleontology. 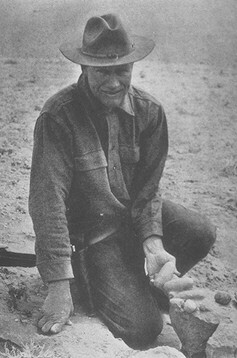 Andrews is best known for the Central Asiatic Expeditions he led into the Gobi Desert in the 1920s. Using brand new motorcars and long lines of camels carrying gasoline and food, Andrews and his scientific team set out to find the origins of humanity. Instead, they found a trove of prehistoric animals of all kinds, including an early horned dinosaur, Protoceratops andrewsi (named in Roy’s honor). In addition to many other wonderful fossil treasures, Andrews left an even larger legacy on the broader museum and exploring world. He became the director of the AMNH in 1934, and was also the president of the Explorer’s Club in New York for several years. His books were widely read and left an indelible mark on the brave scientists and adventurers that would follow him. Though he has often been described as the ‘real life Indiana Jones,’ it may be wiser to consider Indiana Jones as the fictional Roy Chapman Andrews. Share your favorite RCA pictures and dinosaur discoveries with us on Facebook and Twitter using the hashtag #TDIDinos. On this day in dinosaurs, the Academy of Natural Sciences in Philadelphia unveiled the first permanent public exhibition that depicted dinosaurs in a new light. The ideas of the ‘dinosaur renaissance’ that began in the 1960s had finally made the mainstream enough to warrant serious consideration by museums around the world. The Academy–first to discover a relatively complete dinosaur skeleton in the U.S. and also the first to display a dinosaur skeletal reconstruction anywhere in the world–became the first to show the new ‘warm-blooded’ dinosaurs to the world in a major way. The exhibit opened on this day in 1986 was called “Discovering Dinosaurs” and showcased their ‘rediscovery’ and transformation from lumbering lizards to complex animals in the minds of paleontologists and the public. Discovering Dinosaurs at the Academy of Natural Sciences, circa 1992. Photo by author. 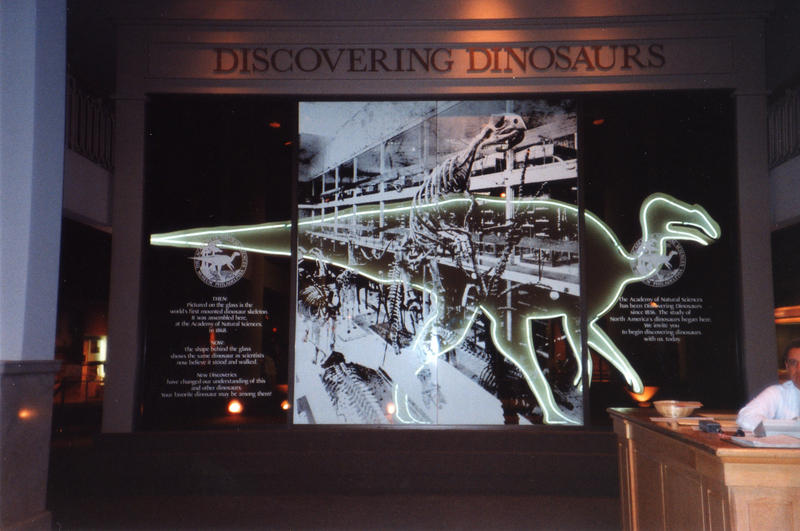 A neon Hadrosaurus foulkii greeted visitors–casts of its famous bones were placed in anatomically correct positions behind this facade–and the illuminated image of its famous skeleton loomed large behind the fluorescent outline. Here was the Academy’s past meeting its present. I first saw the exhibit in 1992, and as I crossed the threshold beyond the hadrosaur wall, I was ambushed by the most frightening of faces. 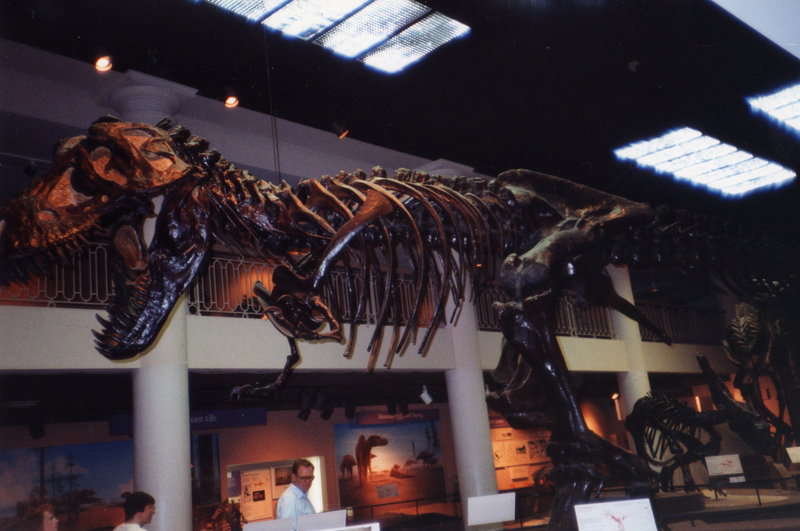 T. rex at the Academy of Natural Sciences, Philadelphia, circa 1992. Photo by author. Tyrannosaurus rex assaulted the visitor in attack mode. This mount was photographed extensively for dinosaur documentaries in the late 80s and early 90s, as it was the only skeletal mount on display in the U.S. with an anatomically correct T. rex. The famous specimens in New York and Pittsburgh were still dragging their tails and wouldn’t be given scientific facelifts for years to come. Visitors were delighted by active dinosaurs. No longer marching in solemn parades, these skeletons portrayed highly active creatures. Nests of Maiasaura eggs, Deinonychus slashing at a Tenontosaurus mother while her young scurried away, a bucking Chasmosaurus, and a majestic Corythosaurus were all a wonderful tribute to the diversity of Cretaceous dinosaurs. The exhibit has been enhanced in recent years, but it still retains the magic it displayed when it first opened. Standing next to the gigantic leg bones of Ultrasauros was a great a thrill for me as a boy, and doing so remains one of the highlights of any visit to the Academy today. Share your pictures from the Academy of Natural Sciences of Drexel University with us on Facebook and Twitter using the hashtag #TDIDinos.